This Yahoo© map blends satellite imagery with labels for major sites and streets. It shows Woodland Avenue from its start at Broadway, to about East 80th Street. The aptly named Cuyahoga ("crooked") River can be seen in the lower left. To display an interactive version of this map, click here. The land near the river was swampy and bug-infested, so in 1796 Cleveland began up the hill, around what is now Public Square. 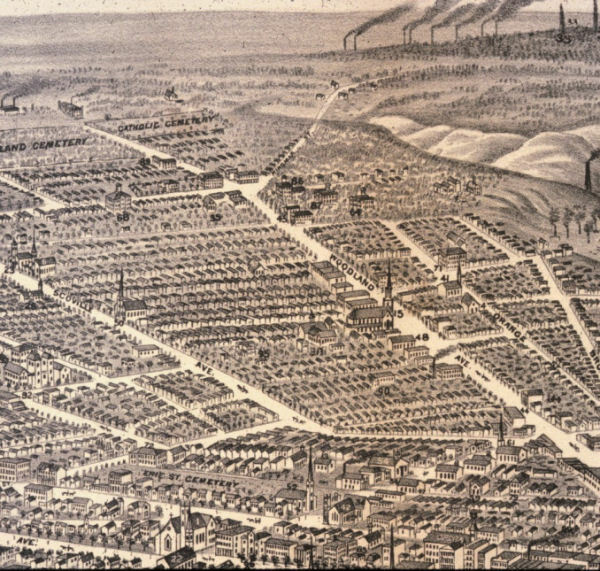 In 1840 the city's first Jews settled southeast of Public Square, near the Central Market (see GATEWAY DISTRICT, upper left) and built their first synagogue in 1846 where Jacobs Field (now Progressive Field) is shown. As the city expanded from its core in all directions, except north of course, ethnic groups tended to not to cross the river. Irish on the near West Side might move west on Lorain Avenue, then to Kamms Corners, then Rocky River, then farther west. Some ethnic groups such as the Polish moved south or southeast. 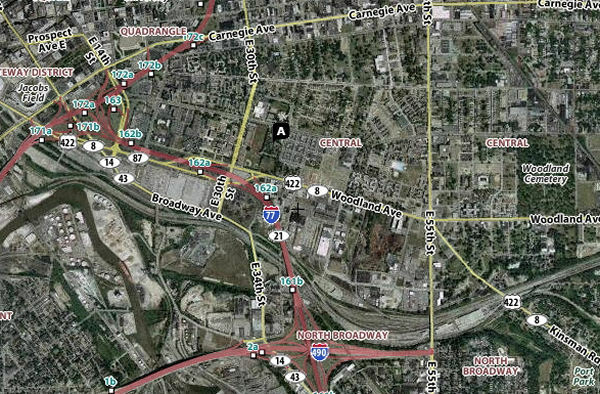 Many Italian immigrants would move east, from Woodland to Mayfield Road near Euclid (Little Italy), then to the suburbs. For the largely Roman Catholic immigrant population that arrived after 1880, these clustering patterns were reinforced by the many nationality-based parishes, where old-country customs and sermons in the old language would be a comfort to new arrivals. For Jewish Clevelanders, moving "up" to newer, better housing would mean moving east. Perhaps one or two moves east in the Central District or along Woodland, then northeast to Glenville (annexed in 1905) or east to Kinsman, then to the Heights. Sam and Minnie Klausner, documented in our Generations section, followed that pattern. A suggestion: Fifty years of extensive urban renewal on the near east side - notably public housing, our Community College and Cleveland State University - have replaced many old buildings, including our earliest synagogues. Thus, a drive east on a street such as Woodland Avenue gives a very limited sense of history. But a drive west from downtown on Lorain Avenue is a tour of historic landmarks supported by its own website. This incredibly detailed drawing shows Woodland Avenue looking southeast. The major intersection of five streets in the upper part of the drawing is Woodland, going east west, Willson Avenue (now East 55th Street) north-south and Kinsman Road, southeast. Streetcars on Woodland and Kinsman would help open up more of Cleveland's east side. The Central Market, the neighborhood where Cleveland's first Jews lived, is at the intersection of Broadway (the street at the far right) and Woodland.